Note: This is a Project Summary page. Go here for Construction Details and Public Meetings. The project is fully funded at $68.174 million for design and construction from two funding sources: $28.174 million in Defense Access Road Program funds from the Department of Defense, and by a $40 million grant from the DoD Office of Economic Adjustment (OEA) for transportation projects at BRAC-impacted military medical facilities. OEA provided a $34 million supplemenmtary award in 2016, bringing total funding for theis project to over $102 million. Additionally, the Crossing Project has been combined with the SHA Intersection Improvement Ppoject at MD 355/Jones Bridge Road. Develop at-grade Transportation Systems Management and Transportation Demand Management elements to promote pedestrian safety and improve traffic operations. 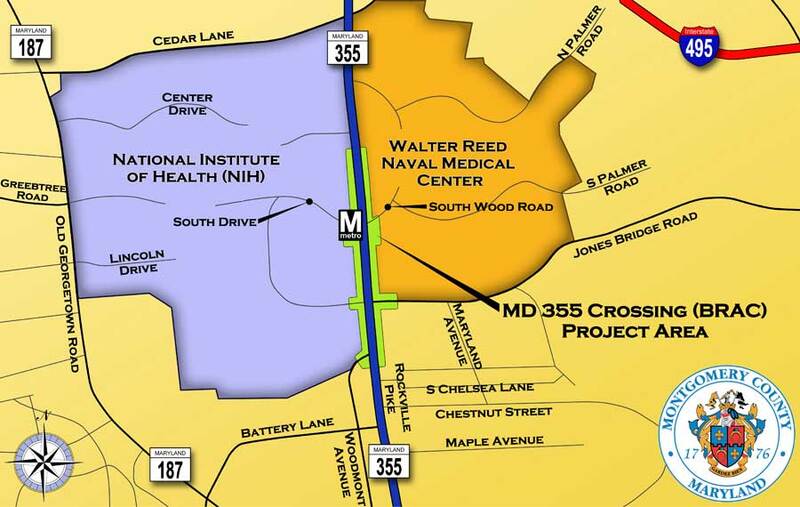 The MD 355 Crossing (BRAC) project is located in Bethesda, Maryland, a densely populated and developed area inside the Capital Beltway (I-495), and adjacent to the National Institutes of Health (NIH) and Naval Support Activity-Bethesda (NSAB), which is home to the Walter Reed National Military Medical Center (WRNMMC). The focus of project is on the intersection of MD 355/Rockville Pike and South Wood Road/South Drive. improve the capacity and operation of the intersection of MD 355 (Rockville Pike) and Jones Bridge Road/Center Drive. The project includes a proposed shallow underpass below MD 355, new deep high-speed elevators and emergency stairs on the NAVY side, and a new deep tunnel connection between the new deep high speed elevator and the existing Metrorail tunnel. In addition, roadway surface improvements include traffic signal, pavement resurfacing, full-depth pavement, sidewalk/bike path, median work, and stormwater management facilities; extension of the southbound MD 355 left turn lane in the existing median of MD 355 to improve queuing for vehicles turning left onto South Wood Road; and MD 355/Jones Bridge Road intersection improvements (curb radius expansions and reductions, improved sidewalks and a shared use path, pedestrians crosswalks, traffic signals, drainage, and paving). Additional information about the MD 355 (Rockville Pike)/Jones Bridge Road intersection project can be fiound here. Montgomery County Department of Transportation has received approval of plan from the Federal Highway Administration. A design-build process will be used to expedite construction once a contract has been awarded. April 19, 2013 MCDOT Industry Information Meeting for Design-Build MD 355 Multimodal Crossing Project at the Medical Center Metro Station and the MD 355/Jones Bridge Road Intersection Improvement Project. 6-28-16 Montgomery County Council: Amendment to the FY15-20 Capital Improvement Program and Supplemental Appropriation to the FY16 Capital Budget -- Department of Transportation, MD 355 Crossing (BRAC): $36,000,000. 12-6-10 Montgomery County Planning Board discussion of Staff Recommendations on the MD 355 Crossing Project -- Local Preferreed Alternative. Alternative 3: Grade Separation w/NIH Jug Handle. Alternative 4: Grade Separation w/"Diamond Interchange"
7-29-08 Technical Discussion Paper by MD State Highway Administration (SHA) on why a Beltway exit to NNMC may not be feasible.